Welcome to the Mad Money Coupon Book! The Mad Money Coupon Book is delivered to Fort Wayne consumers via the mailbox and is chock full of savings from area businesses including: restaurants, auto repairs, home improvement, hair, tanning, nails, carpet cleaning, service companies and other types of businesses. 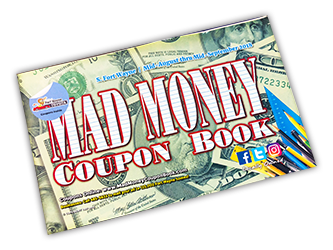 The Mad Money Coupon Book is the preferred direct-mail advertising company in Fort Wayne, IN, offering an inexpensive, mailed, saturation advertising solution for local businesses by reaching the local consumer via the mailbox. The Mad Money Coupon Book is distributed ten times per year via USPS. Each issue is mailed to over 130,000 Fort Wayne households. Contact us today! Join our mailing list to stay informed about the latest deals, coupons, & savings in Fort Wayne! We offer coupons and savings for Fort Wayne restaurants,gyms, home repair, automotive centers, carpet cleaning, shopping, dining, & much more! We can help you get your message to over 130,000 Fort Wayne area households!